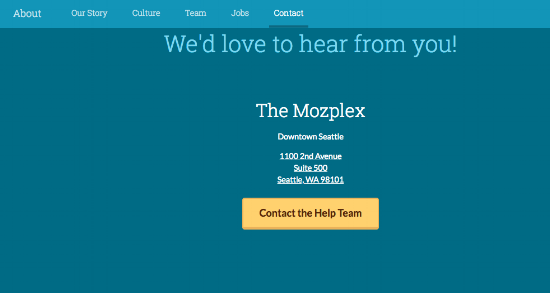 If someone was searching your site and wanted to get ahold of you, what would they see on your Contact Us page? A phone number? An address and map? Nothing? Well, hopefully it isn’t nothing! Marketers often spend so much time focusing on the design and content of the home page and service page that they neglect the Contact Us page. However, the Contact Us page should be one of your most important pages. Think about it. If someone clicked on your Contact Us page, then they are obviously interested in speaking with you! Therefore, your Contact Us page should be more than just a number and a generic email address. At Bluleadz, we love our YETI cups. You can find one on every employee’s desk (no joke). But what’s even better than YETI’s awesome drinkware is their kickass Contact Us page. 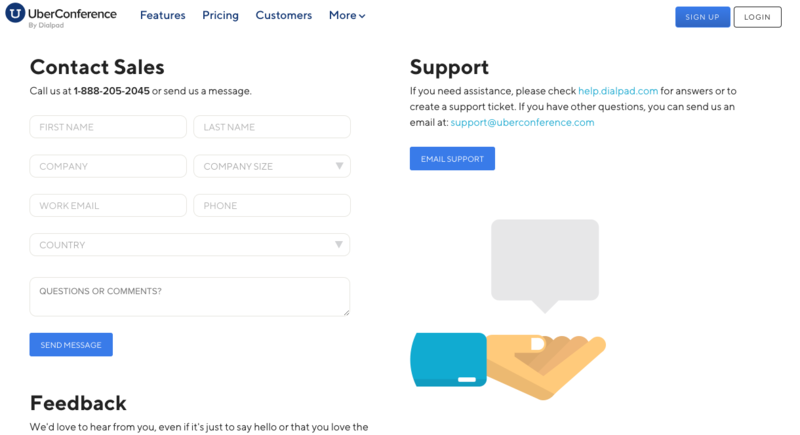 The page is clean and easy to read, and it includes the phone number, office info, and links for people to reach out via email and connect on social. Their call-to-action (CTA) for frequently asked questions also provides the next step for those who want to search online for their answers. Forget email. Send a postcard! 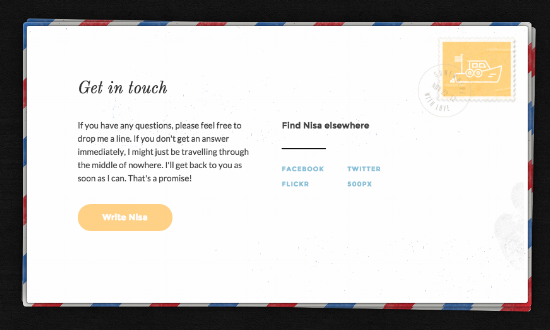 Or at least make your Contact Us page look like a postcard. The travel site, Let’s Travel Somewhere, kept their travel theme going by making a fantastic Contact Us page that looks like a postcard. With a simple CTA button, you can send a message. However, on the right side of the design, instead of an address like most postcards, there are links to social sites to keep users engaged. 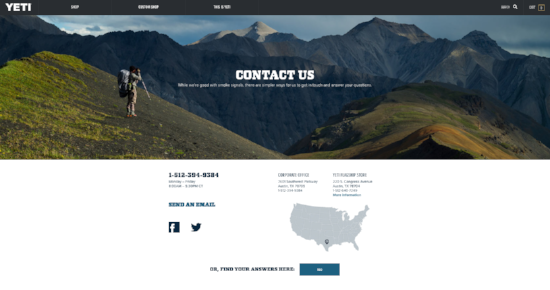 It’s not your typical Contact Us page look and feel, which is what makes it stand out. 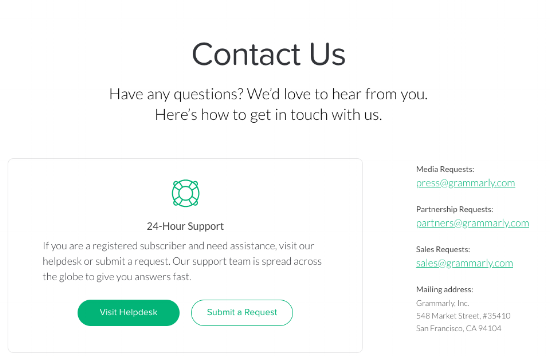 Keeping your Contact Us page simple and clean is always a good idea. After all, users are on the page because they want to contact you, so don’t confuse them with too much unnecessary info. Grammarly does a great job demonstrating a clean page design for their users. Their contact info on the right is easy to see, and they also have CTAs to visit their helpdesk and/or to submit a request. The simple, easy-to-use page also matches their overall brand. A good Contact Us page doesn’t need to be complicated. It’s no surprise that a company like Coca-Cola would have a great Contact Us page. With their easy-to-use chat box appearing as soon as you hit the page, it makes it easy to instantly type in your question. The tabs at the top also send you right to the FAQs for those who want to find their answers online. As you scroll down, you see their general contact info, social icons, and even have a place to submit an idea to the company. You don’t need a flashy design to have a good about us page! Moz keeps it simple and to the point with this simplistic page. They have their address and a CTA to go to their help center for additional assistance. Beneath that (not pictured) is a map of their location. Nothing more. It’s a great example of how you don’t need to overwhelm your users, and the CTA allows them to move to the next step for what they need assistance with. We use UberConference a lot here at Bluleadz. And when we need to contact them for support, we don’t mind visiting their Contact us page. With the phone number and email clearly displayed, it makes it easy to reach out. And, as if they couldn’t make it simpler, they have a form right there that you can use to submit a specific question and get it answered. Wendy’s' Contact Us page has a simple and clear message: Contact us at your convenience. Not only is the page designed nicely, but they have a survey at the top that allows you to share your opinions. 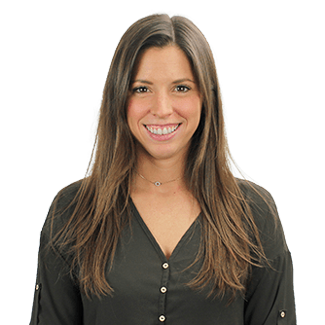 They also communicate that you can conveniently contact them by texting or sending a message with a simple form. There are probably a variety of individuals visiting your website. Are they looking for sales? Do they need customer support? 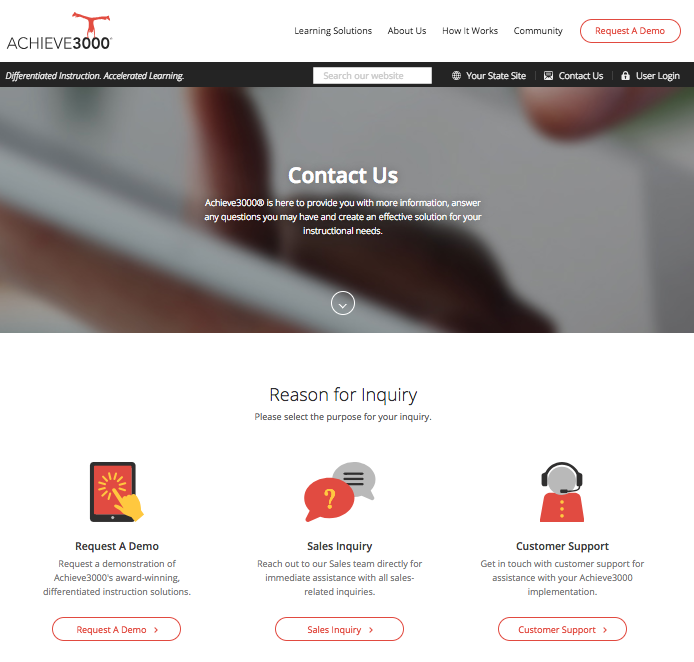 Achieve3000 makes it easy for people visiting their site to find what they need with three targeted CTAs. By segmenting it like this, you can make it easy for everyone to contact the department that is right for them. 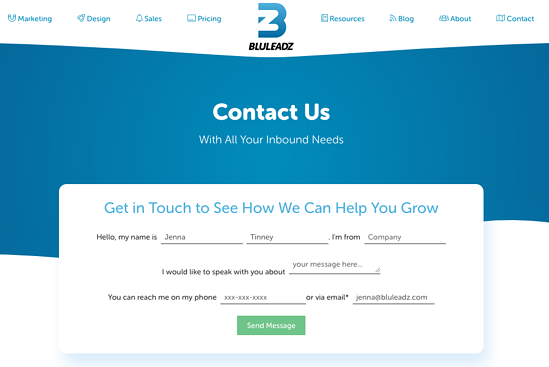 Not that we want to toot our own horn, but we do love our Bluleadz Contact Us page. We recently rebranded our website and the form on the page isn’t your average look; it has more of a Mad Libs look. Under the form (not pictured), we have a map to our new office along with the address, phone number, and email. 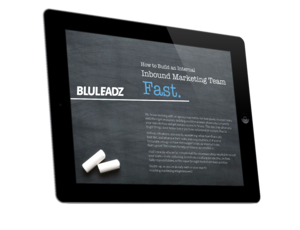 We also used this opportunity to include CTAs for guest blogging and joining the team, making it easy to learn about these common inquiries that we receive. If you don’t have the time to give your Contact Us page a complete makeover, then there are still some quick wins you can do that are easy to pull off. 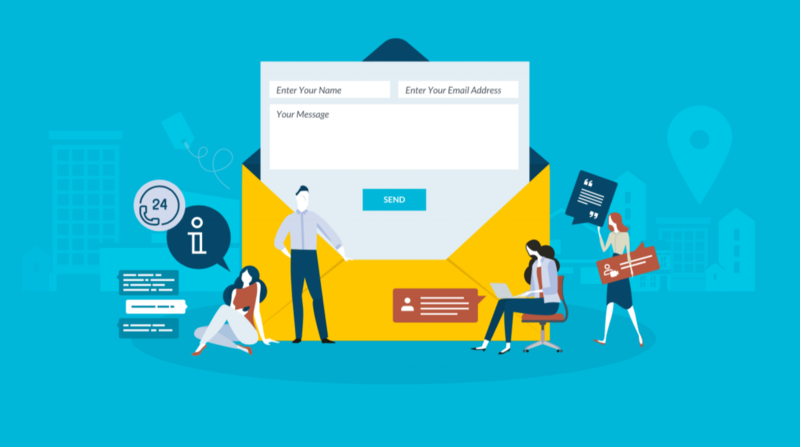 By making it simple and easy for visitors to contact you, you’re creating an opportunity to increase your leads and help potential customers. What are some of your favorite Contact Us pages? Share your thoughts in the comments section below. Let These Pages Inspire Your Own Website Design!